The Kerala state civil services academy has invited applications for coaching classes for Civil Services Examination 2014 June batch. Being a six month intensive coaching programme, the classes would commence on 2nd June 2014 onwards and ends in the second week of November. The weekend batch would start from 7th June onwards while the evening batch is scheduled to start from 4th June. The Kerala state civil service academy which is established under the centre for continuing education has become the prime institution giving ample help to the civil service aspirants. The admission to the centre will be based on an entrance examination to be held on 26th May, the application forms should reach the academy before 23rd May 2014. 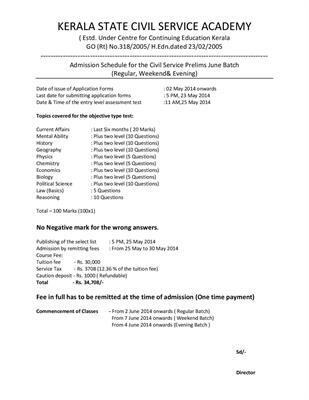 An entry level test would be conducted at 11 AM on 25th May 2014. The objective type test of maximum 100 marks covers topics such as current affairs, mental ability history, geography, physics, chemistry, economics, biology, political Science, law and reasoning. With no negative marks for wrong answers, students can attend all questions. The list of selected students will be published in 25th May at 5 PM. Those selected students who wish to attend the classes must have to pay an amount of Rs 34, 708, which include the tuition fee and caution deposit which is refundable. The classes are held Monday to Friday from 7 a.m. to 6.00 p.m. General Studies are held between 9.15 am and 4.00 pm while evening hours, 4.00 p.m. to 6.00 p.m. are generally designed as library Hours. The students' presence at the library during library hours is compulsory. As test papers are conducted every week, students can check their progress and take remedial steps. The classes for optional subject will be conducted either from 7 AM to 9 AM or from 4 PM to 6 PM. Meanwhile, important topics of the first paper of each optional subject will be taught during the time of Prelims coaching. For more details visit the official website of Kerala state civil service academy.